It’s been a rough week for China’s diplomats. Japanese Prime Minister Shinzo Abe is visiting the United States, leading to a litany of overt or implied criticisms of China’s ‘assertive’ behavior in disputed maritime regions. And even as Abe began his U.S. travels, the ASEAN Summit, held in Malaysia, inevitably had to address the issue of China’s actions in the South China Sea. The resulting ASEAN statement criticized land reclamation activities as having the potential to “undermine peace, security, and stability in the South China Sea.” ASEAN members also “reaffirmed the importance of maintaining peace, stability, security and freedom of navigation in and over-flight over the South China Sea” and urged the speedy conclusion of a Code of Conduct in the South China Sea. Those words, though tougher than past statements, are still relatively toothless. As The Diplomat’s Prashanth Parameswaran put it, “the South China Sea question received significant attention but saw little progress.” But even that scant progress has earned China’s wrath. When asked about the ASEAN statement in a press conference, Chinese Foreign Ministry spokesperson Hong Lei said, “The Chinese side is gravely concerned about the statement of the 26th ASEAN Summit on the South China Sea issue.” China’s main complaint has always been that ASEAN summits are not a proper place to discuss the South China Sea, as only four of the ten ASEAN nations have claims to disputed islets in the area. The South China Sea “is not an issue between China and ASEAN,” Hong reiterated. China’s “dual-track approach” to the South China issue (described here by my colleague Prashanth) means resolving the disputes through bilateral negotiations with the other claimant countries even while working with ASEAN to uphold peace and stability in the South China Sea. Hong mentioned both these elements in his press conference. However, because China resolutely rejects the idea that its actions have jeopardized “peace and stability” in the region, it also rejects the need for ASEAN to become involved to uphold those principles. China, Hong said, “has exercised great restraint on the relevant issue.” The implication is that there’s no need for ASEAN is get involved at all. For starters, Hong argued, “There has never been any problem concerning the freedom of navigation and over-flight in the South China Sea that all countries are entitled to under the international law. Nor will there be any in the future.” China also rejects the idea that its land reclamation and construction activities are destabilizing. “Relevant construction is lawful, justified and reasonable and thus beyond reproach,” Hong insisted. Xinhua also juxtaposed the Philippines’ “Sinophobia” with Vietnam’s move to smooth relations with China. “[S]ome countries that have disputes with China have chosen to focus on cooperation,” Xinhua said, citing Vietnam’s Communist Party secretary Nguyen Phu Trong’s “fruitful visit to China” earlier this month. China’s criticism of the ASEAN Statement on the South China Sea essentially rejects the idea that any non-disputant (or any country expect the Philippines, for that matter) has legitimate concerns about rising tensions in the South China Sea. That response makes it clear that Beijing will continue to reject ASEAN’s statements and positions on the South China Sea issue. 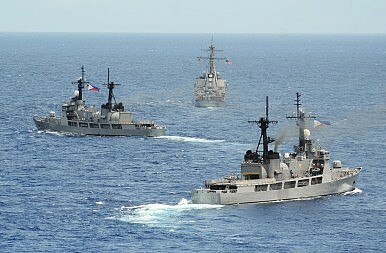 China Building on Scarborough Shoal? Don't Hold Your Breath.China Congratulates Philippines' New President DuterteChina: Yes, We Sent Ships to Jackson Atoll in SpratlysCan Singapore Smooth China-ASEAN Relations? Can China Rebuild Its ‘Special Relationship’ With Malaysia?